[141 Pages Report] The FinTech blockchain market size is expected to grow from USD 230.0 Million in 2017 to USD 6,228.2 Million by 2023, at a Compound Annual Growth Rate (CAGR) of 75.9% during the forecast period. The base year considered for this report is 2017, and the market forecast period is 2018–2023. The major growth drivers of the market include higher compatibility with the financial services industry ecosystem, the rising crypto-currencies market cap and Initial Currency Offering (ICO), reduced cost of transactions, and reduced total cost of ownership. The major objective of the report is to define, describe, and forecast the global FinTech blockchain market by provider, application, organization size, vertical, and region. The report provides detailed information related to the key factors (drivers, restraints, opportunities, and challenges) influencing the growth of themarket. The report aims to strategically analyze micromarkets with respect to the individual growth trends, prospects, and contributions to the total market. The report attempts to forecast the market size with respect to 5 major regions, namely, North America, Europe, Asia Pacific (APAC), Middle East and Africa (MEA), and Latin America. The report strategically profiles the key players and comprehensively analyzes their core competencies. It also tracks and analyzes competitive developments, such as partnerships, collaborations, and agreements; mergers and acquisitions; new product launches and developments; and Research and Development (R&D) activities in the FinTech blockchain market. The FinTech blockchain market comprises vendors, such as AWS (US), IBM (US), Microsoft (US), Ripple (US), Chain (US), Earthport (UK), Bitfury (US), BTL Group (Canada), Oracle (US), Digital Asset Holdings (US), Circle (Ireland), Factom (US), AlphaPoint (US), Coinbase (US), Abra (US), Auxesis Group (India), BitPay (US), BlockCypher (US), Applied Blockchain (UK), RecordesKeeper (Spain), Symbiont (US), Guardtime (Estonia), Cambridge Blockchain (US), Tradle (US), and Blockchain Advisory Mauritius Foundation (Mauritius). The other stakeholders in the market include crypto-currency vendors, research organizations, network and system integrators, blockchain services providers, and distributed ledger technology solutions providers. Detailed analysis and profiling of additional market players up to 5. The FinTech blockchain market is expected to grow from USD 370.3 Million in 2018 to USD 6,228.2 Million by 2023, at a Compound Annual Growth Rate (CAGR) of 75.9% during the forecast period. The major drivers of the market include the higher compatibility with financial industry ecosystem, the rising crypto-currency market cap and Initial Coin Offering (ICO), faster transaction, and reduced total cost of ownership. The future growth opportunities for market include the rising adoption of blockchain applications, such as payments, clearing, and settlements, smart contracts, and identity management, and a new breed of programmable blockchain platform. 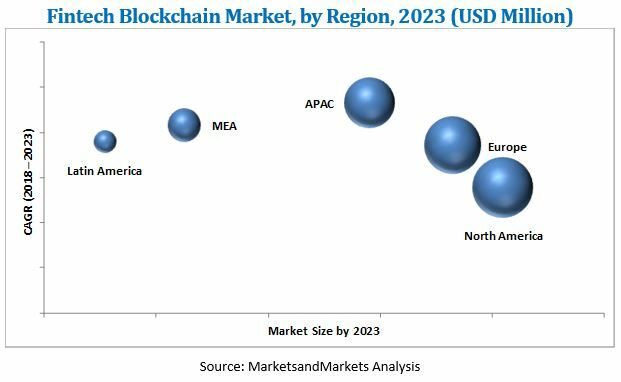 The FinTech blockchain market study aims at estimating the market size and future growth potential of the market across different segments, such as providers, applications, and regions. The application segment includes payments, clearing, and settlement, exchanges and remittances, smart contracts, identity management, compliance management/Know Your Customer (KYC), and others (cyber liability and content storage management). The payments, clearing, and settlement segment is expected to dominate the application segment in terms of contribution to the overall market, as financial companies are deploying blockchain-based smart contracts to bring reduction in costs of verification, execution, arbitration, and fraud prevention. The FinTech blockchain market has been segmented on the basis of providers into 3 categories: application and solution providers, middleware providers, and infrastructure and protocols providers. These providers offer infrastructure to develop in the blockchain-based platforms. Among these types, the application and solution providers segment is the fastest-growing segment in the overall market. The introduction of technologically advanced blockchain solutions has witnessed a certain level of adoption in financial companies, thereby fueling the overall market growth. FinTech blockchain applications are witnessing an increasing demand across the financial industry. Applications such as payments, smart contracts, and compliance management/KYC are assisting banks, investment banks, and insurance companies to enhance their efficiency and reduce infrastructure cost. The non-banking financial services, such as asset management and wealth management, are expected to dominate the market during the forecast period, due to the growing importance of FinTech blockchain applications. This, in turn, is expected to enhance the customer satisfaction, prevent fraudulent transactions, provide faster transactions, and reduce total cost of ownership. The large enterprises segment is expected to dominate the market in terms of market size, as large enterprises are focusing on implementing blockchain applications to improve the customer loyalty and have an overall reduced infrastructure cost. However, the Small and Medium-sized Enterprises (SMEs) segment is expected to grow at a higher CAGR, owing to the easy availability and scalability of cloud-based deployments. In terms of geographic coverage, the FinTech blockchain market has been segmented into 5 regions, namely, North America, Asia Pacific (APAC), Europe, the Middle East and Africa (MEA), and Latin America. North America is expected to account for the largest share of the overall market in 2018. North America is considered the most advanced region with regard to technology adoption and infrastructure. The wide presence of the key industry players of the blockchain technology solutions in this region is the major driving factor responsible for the growth of the FinTech blockchain market. Financial companies in this region are moving toward the adoption of the blockchain technology. Furthermore, APAC is expected to account for the highest growth rate during the forecast period, due to the increase in the overall investments in the blockchain technology solutions to change the business processes in the finance industry. The key financial hubs, including Hong Kong and Singapore, provide huge opportunities for the adoption of blockchain applications in the financial industry. However, lack of awareness and technical understanding about the blockchain technology can act as a restraining factor in the market across various regions. The major FinTech blockchain technology market vendors include AWS (US), IBM (US), Microsoft (US), Ripple (US), Chain (US), Earthport (UK), Bitfury (US), BTL Group (Canada), Oracle (US), Digital Asset Holdings (US), Circle (Ireland), Factom (US), AlphaPoint (US), Coinbase (US), Abra (US), Auxesis Group (India), BitPay (US), BlockCypher (US), Applied Blockchain (UK), RecordesKeeper (Spain), Symbiont (US), Guardtime (Estonia), Cambridge Blockchain (US), Tradle (US), and Blockchain Advisory Mauritius Foundation (Mauritius).). These players have majorly adopted partnerships, agreements, and collaborations; and new product launches as their key growth strategies to offer feature-rich blockchain technology solutions to customers and further penetrate into untapped regions.